​The HERO4 is definitely a step in the right direction, although the improvements are divided between the two editions. The Black Edition is designed for professionals, while the Silver Edition is more for consumers who want a premium experience. Staying true to the HERO line, the HERO4 makes no big deviations in form, weight, or even color scheme. That's not to say it's not different. Turn the back around and you'll find one of the biggest new additions: a built-in LCD color touch screen. While this is only available on the Silver Edition, it makes it simple to frame and review photos and videos without having to touch your computer. The HERO4 does change button placement, removing the Wi-Fi button in place of a single settings button. To make way for the LCD screen, the HERO4's shifted the battery compartment from the back of the camera to the bottom. 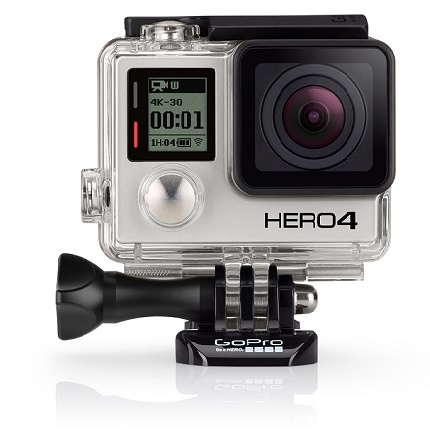 This also means that batteries for GoPro's older models are incompatible with the HERO4. 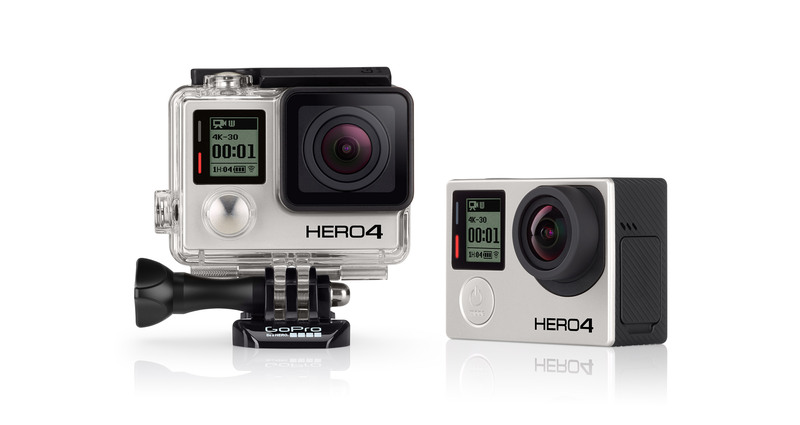 The HERO4 Black Edition is the first of its kind to support 4K video at 30fps. Both the Black and Silver Editions support 60fps 1080p video and 120fps 720p video. The HERO4 takes high-quality 12mp images and supports a burst mode of up to 30fps. In addition to the features of previous GoPro models, such as SuperView, Video Looping and Auto Low Light, the HERO4 promises better night-time photos by allowing light to hit the shutter for a longer period of time. The new features, known as Night Photo, lets you keep the shutter open from 2 to 30 seconds in order to maximize the amount of light reaching the camera. The HERO4 also provides a means for changing advanced camera settings such as white balance, color profile, ISO limit, and image sharpness. The HERO4 also introduces improved electronic video stabilization and MCTF (motion-compensated temporal filtering), which promise cleaner image quality and smoother video. The HERO4 boasts a processor that's twice as fast as the HERO3, making it a powerhouse capable of recording 4K video at twice the frame rate of previous models. The HERO4 is limited less by its ability to shoot high-resolution images and more by its ability to store it. 4K video can easily fill a 16GB microSD card in 30 minutes. Battery life has been a concern for many HERO users, and unfortunately the HERO4 is no exception. At its maximum resolution and frame rate, the HERO4 will only last an hour with Wi-Fi tuned off. Turning Wi-Fi on will drop the battery life by at least another 10 minutes, and any actions performed over Wi-Fi will drop your expected runtime even further.. The most you can expect to squeeze out of your HERO4 without buying GoPro's Battery BacPac accessory is a little less than 2 hours, and that's only if you restrict your footage to 720p. The HERO4 boasts a Wi-Fi chip that's 4x as fast as previous models, as well as built-in Bluetooth for pairing with another device. The GoPro app converts your smartphone or tablet into a full blown remote control with access to all of the camera's functions and settings. The app's viewfinder feature will even stream live video directly from the camera. Another interesting new feature is HiLight Tagging, which lets you tag key moments in a video to make them easier to find while editing. By pressing the settings button while recording, the HERO4 tags the current point in the video. Footage imported into GoPro Studio will appear with the tag at the specific point in the video. This makes it easy to identify key points in the video without having to manually scan through it. The HERO4 comes with the standard accessories: waterproof housing up to 40m, two adhesive mounts, quick release buckles, a 3-way pivoting arm, a rechargeable battery, and a USB cable. With both the Black and Silver Editions, GoPro provides two new editions – Surf and Music – which come with unique mounting brackets for surf boards and for instruments respectively. As always, GoPro provides a full range of add-on accessories including battery and LCD packs, remotes, extra batteries, protective lenses and covers, and blackout housing. The HERO4 is a fantastic upgrade from the HERO3 and a serious contender as a premium action camera. GoPro's managed to squeeze improved battery life, a faster processor, faster Wi-Fi, and a slew of user-friendly features in a familiar package. The only tradeoffs come in deciding which package to get: the gorgeous touch-friendly LCD screen on the Silver Edition is preferable for most users, while the super-smooth super-high resolution 30fps 4K video on the Black Edition is ideal for professionals.